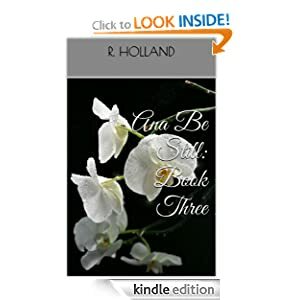 Please welcome to my attic author R. Holland. 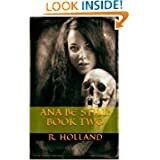 R. Holland has a series called Ana Be Still which you all should definitely check out, especially since it’s on sale. I have dusted off an old rocker and sprayed for spiders so we’re all set. So, tell me R. Holland, what is the name of your book and the general plot? 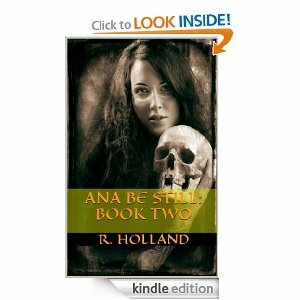 The name of my book/series is Ana Be Still. It has three books total and I’m considering a fourth. In the first book of the series, it begins introducing this vampire name Simon. I wanted him to be the typical lustful vampire, but he actually has standards and rules. He likes to keep to himself but realized the benefits of having a pack around. The girls hunt for him, and there is a young vamp named Soloman that Simon keeps around just because. So it kinds of lets us know that Simon has a heart after all. After finding out that his pack is out of control, he leaves heading North and stumbles upon a group of seekers who capture him, taking them to their compound. Simon hates seekers and has vowed to kill every single one of them. Seekers aren’t our typical humans. Seekers have special powers, making them a fair opponent for the vampires. And then we meet the wonderful Analisa Slayter which very soon we are told she is really Analisa Still. Analisa is a nineteen year old, who wakes up Christmas morning and notices she has changed. Suddenly she can hear thoughts and sense fear. Her parents tell her they have to take her somewhere, which is really the compound, but the way they do it is all wrong. They blindfold her and tell her to keep it on until they arrive. As they arrive to their destination, things go sour in the car as she tries to take off the blindfold. Her mother gives her something in a needle and she wakes up in one of the rooms in the compound. Then a tall, young and handsome named Eric comes to her room to take her to the elders so they can inform her of everything that’s going on. They tell her of her sister’s real death and her parents want her to avenge her sister’s death. She doesn’t like the truth and starts making plans to escape. She stumbles upon the dying vampire Simon and his cell mate, and feeds Simon her blood to help him stay alive. They find her in the basement with them but isn’t aware of the crime she committed. The next day her training starts, and she passes everything with flying colors even though someone at the compound removed all weapons and ordered a group of South African seekers to kill her. That night the compound is attacked and she finds herself back in the basement with the vampires. She frees them with the agreement that they won’t kill her once they are free, and they must help her escape. Will the two vampires keep their promise? Who or what attacked the compound and who wanted her dead? You’ll have to read the book to find out! I’m not sure what made me come up with the idea? I remember reading an excellent book (okay a bunch of excellent books) and I realized I had no one to discuss books with. My family, friends and co-workers confessed to me that they didn’t read. And my coworkers are teachers! In fact they hated it. Some said they never had the time to read (which I totally understood) but I felt so sorry for them. I couldn’t imagine not being able to get into a good book. So when I wrote Ana Be Still: Book One, I wanted to make sure it was a book that was short, but still would peak their interests. I found myself cutting a lot out because I had to remind myself who I was writing this for. It was about 32,000 words and I told myself surely this would work. Surprisingly it did! They all read it, proud that I had written a book and published it on Amazon. They said they couldn’t put it down. I wrote the second and third each time trying to go up on the word count. They read all three. Now they have purchased ereaders or have Amazon accounts and buy and read books. So I achieved a goal. I did have a family member say she had to pray after the first one and most of them said it wasn’t their type of genre but they were surprised it held their interest. I realized then how much I enjoyed writing, staying up till 2 and 3 o’clock in the morning. I still don’t remember how I came up with the idea. I just typed and let the story tell itself. I think music played a huge important role because I would hear a song on the radio and I would imagine a scene happening in the story. So I’ll have to give music all the credit for the story. I love Ana, Simon and Eric. Of course why wouldn’t I like all my characters? But the main character is Ana, so I choose her. Life put her in a very bad position and I think she handled it pretty well. Overall she has a very forgiving heart which you’ll see and tries to see the good in everything. She has faced a lot of death and loss but still tries to focus on the task ahead. I would have to say I hate Callie. She was jealous of Ana and Eric’s relationship blossoming and tries to kill her in the second book. She is a seeker and has broken their rules by trying to kill one of their own. But she doesn’t see Ana as one of their own because Ana has something else in her blood. Right now it would be Lana del Rey’s :This is What Makes Us Girls. I listen to that often when writing and I envision a woman staying strong. Right now it would be The Hunger Games Mockingjay (last Book) by Suzanne Collins. It would give me some survival tips and I could do without the ending. I cried for two days after reading the ending. Probably a Turkey BLT on whole wheat with avocado and tomato. The drink would have to be an ice cold coca-cola. What is the biggest mistake you have made in your life? Not writing mistake – any mistake. Even if it happened in 3rdgrade, I wanna know about it. Not being so self-conscious and probably being more outgoing. It is a handicap of mine that I am not really a people person. I know how to socialize but I have to be in the mood for it. Other than that I don’t talk much and I’m perfectly content with being the silent type. Nothing. Cold Foods hurt my teeth. Probably need to see a dentist about that? I’d get the one I love the most to kick the other one’s a**! She could do it too. She’s half vampire. Love it! Okay, now it’s time for the flash favorites. Focus on me, not the creepy mannequin in the corner. Ready? Here we go! Please, no clapping, it stirs up the dust. Seeing the largest spider I had ever seen in my life in my kitchen! 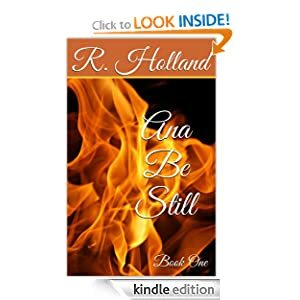 Ana Be Still is on sale for .99 and it is a very short novella. The second book is about 43,000 words and the third book is about 55,000 words. Thanks for having me and I look forward to working with you again! No, no, thank you! Please everyone check out her series on Amazon while the sale lasts. And since I’m still new at this blog thing and am having trouble posting links, please go to Amazon and find her because I don’t think this thing is working right. This entry was posted on July 14, 2013 by AttyEve.